killa hearts you: Nails pt.... ? i had a cute mani done for Caribana but the colours (electric coral, white, green) just clashed all over the place for "everyday" so i had to get rid of it last night. i bought some new colours lately to play with... so this is OPI "Do You Lilac It?". it went on like a dream and i love the colour. 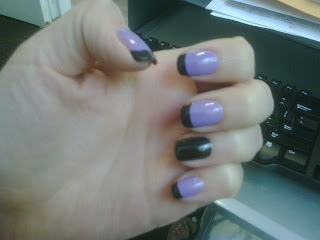 then i busted out the nail art polishes and proceeded to freehand a french mani... an hour and a half later, i had this! Ooh, hot nails! I didn't realize you have this blog now hehe. Hope you're having a good summer!